Mendocino County is a county located on the north coast of the state of California. Based on the 2010 census, the population was 87,841. The county seat is Ukiah. 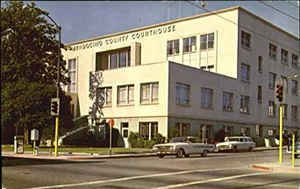 Mendocino County was created on February 18, 1850. The county is named for Cape Mendocino. Cape Mendocino maybe named in honor of either Antonio de Mendoza, Viceroy of New Spain or Lorenzo Suarez de Mendoza, Viceroy from 1580 to 1583. 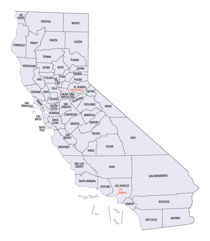 The county derived its name from Cape Mendocino, which was probably named in honor of either Antonio de Mendoza, Viceroy of New Spain, 1535-1542 (who sent the Juan Cabrillo Expedition to this coast in 1542), or Lorenzo Suarez de Mendoza, Viceroy from 1580 to 1583. Mendocino is an adjective form of the family name of Mendoza. Mendocino County was one of California's original 27 counties, created in 1850 by the State Legislature. Because of its small population, Mendocino County was administered by the government of Sonoma County until 1859, when the government was established in a small building on Main Street in Ukiah. County officials moved into the first courthouse at the site bounded by Standley, Perkins, State and Schools streets on January 24, 1860. Mendocino County derives its name from Cape Mendocino, which lies northward of its northern boundary. Cape Mendocino was given its name by a famous Spanish navigator of the 16th century, Juan Rodriquez Cabrillo. Cabrillo discovered it in 1542 while on a voyage of discovery along the Pacific Coast and named it in honor of Don Antonio de Mendoza, the first Viceroy of New Spain (Mexico), and the patron of the voyageur. The first permanent Spanish settlers came to the area in the middle 16th century. It was almost 300 years before the first permanent non-Spanish settlements in the county were made on the coast north of Big River in April of 1852. As reported by the Census Bureau, the county has a total area of 3,878 square miles (10,044 km2), of which, 3,509 square miles (9,088 km2) of it is land and 369 square miles (956 km2) of it (9.52%) is water. 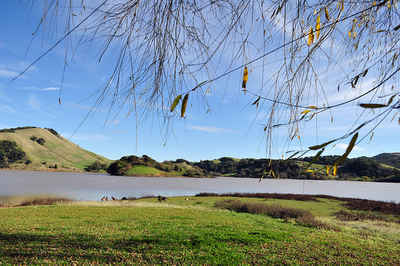 Lake Mendocino is set among the rolling hills and oak groves of Mendocino county near the headwaters of the attractive Russian River, one of the cleanest rivers in the USA. Cuffy Cove is at the north end of Elk. The first farms and sawmill were established here before Mendocino was even settled. This peaceful bluff is a suitable final resting place for the brave pioneers who tamed this wild coast.